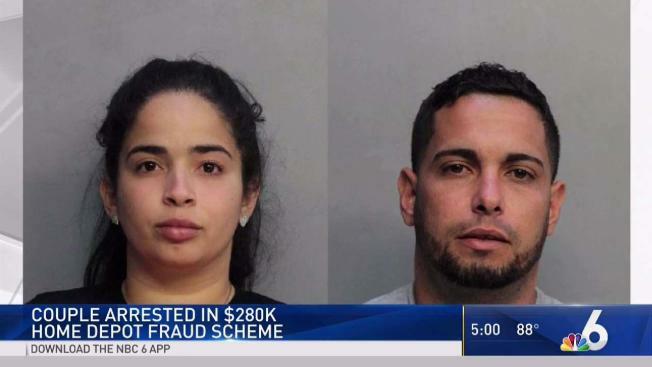 Alfredo Pita-Hernandez, 34, and Stefany Hernandez, 22, were arrested Monday on organized fraud and grand theft charges in the fraudulent refund scheme that dates back to 2014, according to an arrest report. A South Florida couple spent years ripping off Home Depot in a fraud scheme that bilked the hardware retailer out of more than $280,000, authorities said. Stefany Hernandez was even able to get a job as a cashier at a Home Depot in Miramar to "further facilitate their scheme," the report said. The investigation into the North Miami couple began in February and revealed that the couple was stealing merchandise and returning most of it in exchange for Home Depot gift cards, the report said. The pair would hand a cashier items one by one to keep the cashier occupied while they either concealed or underscanned a lesser value item, the report said. They would pay for their purchases with gift cards but later return most of the items for more gift cards, the report said. Home Depot investigators watched Pita-Hernandez conduct multiple fraud transactions at several area stores, and even saw him using some of the stolen merchandise to remodel their home, the report said. After Stefany Hernandez got a job as a cashier, she would check out Pita-Hernandez without scanning multiple items, the report said. She also gave him duplicate receipts to help him return items and provided him with a tax exempt number so he wouldn't have to pay taxes on any items, the report said. When Pita-Hernandez was arrested he had seven Home Depot gift cards in his pockets with a total value of $5,255, the report said. Attorney information for the couple was not immediately available.